Recreate your favorite characters and invent new ones! 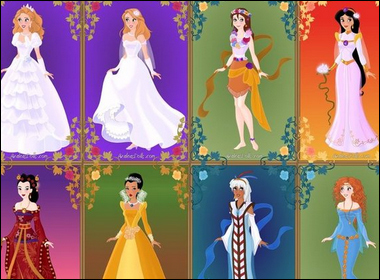 Clothes are organized by theme, with a mermaid page inspired by Ariel; an exotic dancer/Arabian page inspired by Esmeralda and by the women in Aladdin; a humble maiden page, with shirts, bodices and aprons inspired by Belle�s blue dress, Aurora�s peasant dress and such; a princess page, where you can create dresses approximating the ball gowns of most Disney princesses; a tribal page inspired by Pocahontas and Kida; and a Chinese page inspired by Mulan. The Arabian, princess and Chinese sections have an arrow at the bottom to access all the items. This game offers in-depth character customization, with many head shapes, eyes, noses, lips etc, and an extensive hair section with long hairstyles as well as split front/back hair options. Note: hair accessories can be dragged to adapt to more hairstyles. 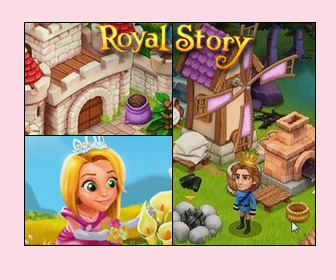 You�ll also find a page dedicated to jewelry, two pages of drag n drop accessories with flowers, gems and earrings, lace, bows, sparkles, feathers, cute animal friends and more. You can change the colors of the background and border to match your doll. The final page is a bonus with some miscellaneous items, such as modern clothes to create yourself as a Disney princess!